Years ago, I was NOT a fan of brussels sprouts. I was definitely a hater. But eventually, I learned it wasn’t the brussels sprouts themselves I didn’t like – it was the PREPARATION. I’ve now become a complete brussels sprout convert, and even consider them one of my favorite vegetables. I think my initial hate stemmed from the fact that the only brussels sprouts I tasted as a kid were boiled, which resulted in a vaguely greenish-brownish, mushy ball of sadness. When I had the opportunity to try them roasted, sauteed, and fried, the clouds parted and I could finally see the brussels sprout light. 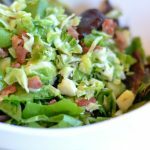 I’ve made brussels sprouts a few different ways over the years, but this shredded brussels sprouts salad preparation is my favorite. It works perfectly as a side dish or as a main dish (especially if you add a little grilled chicken on top). One reason I love making it for a dinner party or holiday meal because it’s a lot lighter than many typical brussels sprouts side dishes, which often involve drenching the vegetables in butter, cheese, and other decadent ingredients. Plus, because it’s a room temperature side dish, it’s one less thing you need worry about keeping hot during those frantic final minutes when you’re trying to get all of your food onto the table! You can use store-bought dressing if you don’t want to make your own, but even if you do make the homemade vinaigrette, this salad can be whipped up in minutes. 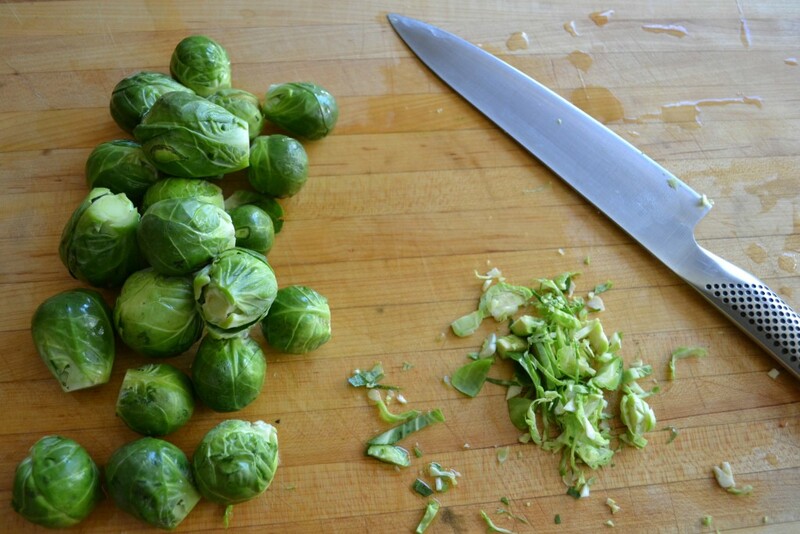 When you chop up the brussels sprouts and give them a light saute, they retain a fantastic crunch and turn a beautiful shade of bright green. 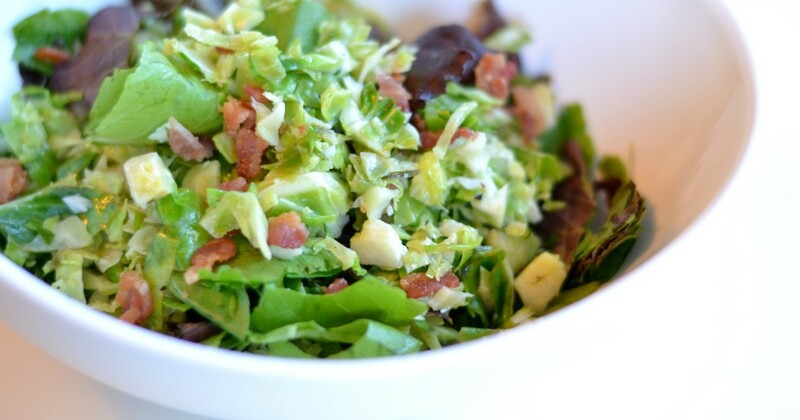 Adding salad greens (arugula is my personal favorite) boosts the freshness and flavor, while the addition of bacon gives it that little bit of decadence and texture that makes it completely delicious. If you’re looking for a holiday side dish that’s quick, healthy, and a crowd pleaser, you need to add this one to your menu. And you might just convert even the staunchest brussels sprouts hater at the table. 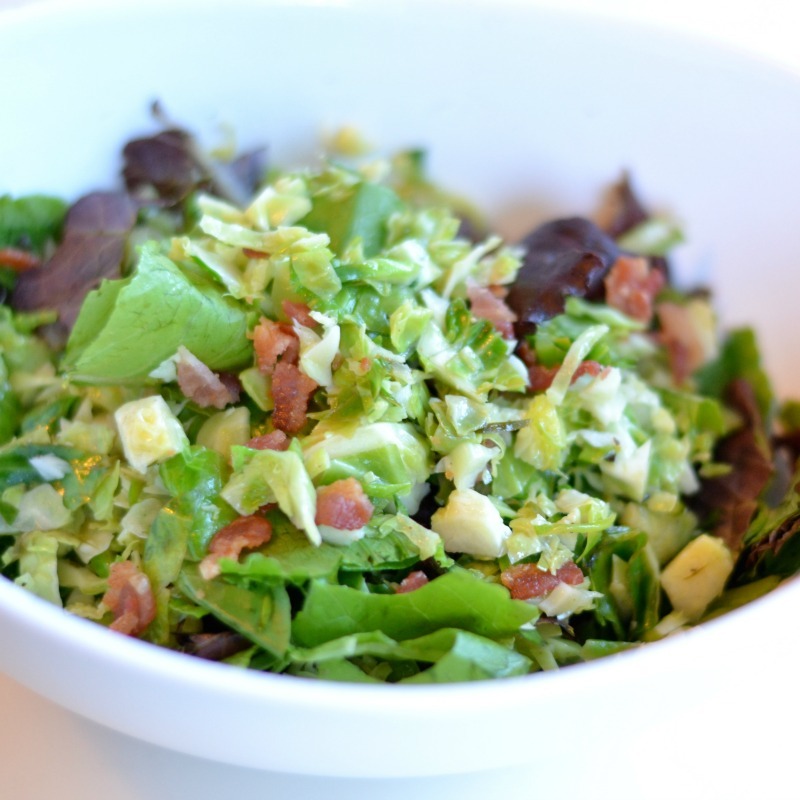 Chopped, lightly sauteed brussels sprouts mixed with arugula, bacon, and a lemony vinaigrette. Cook 5 slices of bacon until crisp using the method of your choice. Cool, chop and set aside for later. In a skillet, drizzle some olive oil, and lightly saute the 3 uncooked bacon slices until they're just starting to render. Add the garlic and chopped brussels sprouts and stir over medium/low heat for about 1 minute. Squeeze in the juice from your lemon slice and sprinkle in some salt and pepper. Saute for an additional 2 minutes, or until the sprouts have softened a little, but still have some crunch, drizzling in a little more olive oil if needed. Add additional salt and lemon juice to taste, and remove from heat. Remove bacon slices and discard. 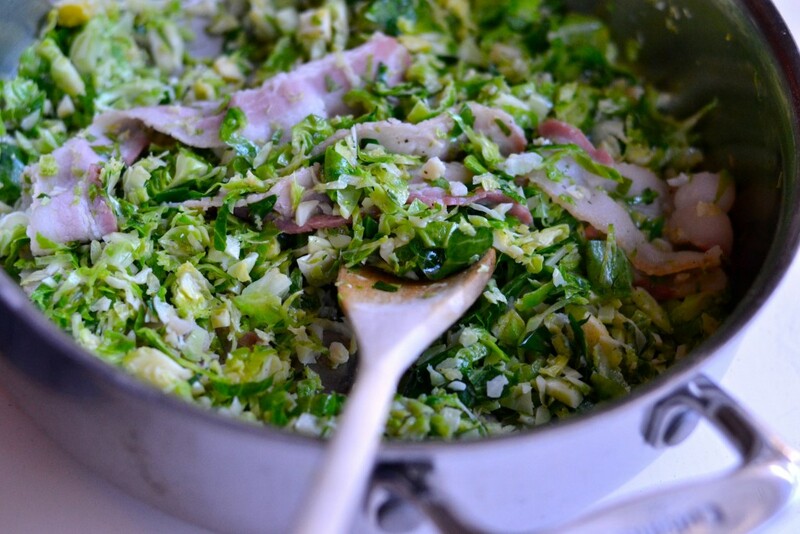 Once the sauteed brussels sprouts have cooled slightly, toss them in a large bowl with the chopped greens and the cooked, chopped bacon. Just before serving, toss with the dressing. Place all ingredients into a closed container and shake until combined. For vinaigrette: Combine ingredients in a bowl and whisk until combined. You know, I used to hate brussel sprouts too and that was because they were usually boiled within an inch of their life. But you are right, when prepared correctly they are divine. Love the idea of using them in a salad like this. I love brussels sprouts! The lemon, garlic and arugula combo sounds amazing!